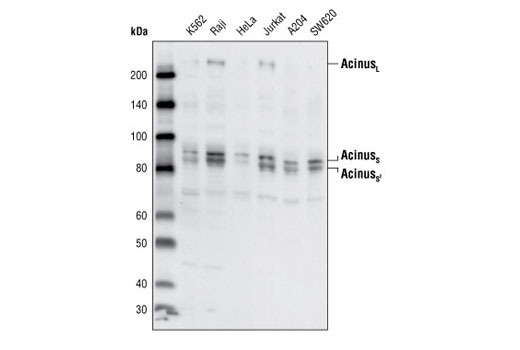 Western blot analysis of extracts from various cell lines, using Acinus Antibody. 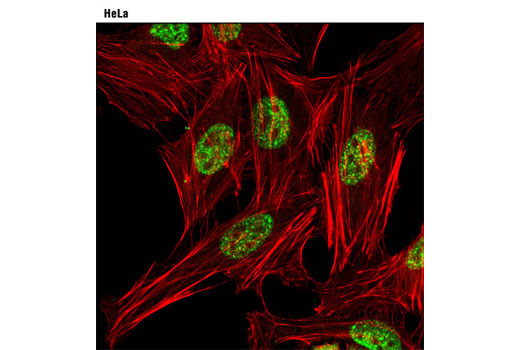 Confocal immunofluorescent analysis of HeLa cells using Acinus Antibody (green). Actin filaments were labeled with DY-554 phalloidin (red). Acinus Antibody detects endogenous levels of total Acinus protein. The antibody recognizes L, S and S' isoforms. Polyclonal antibodies are produced by immunizing animals with a synthetic peptide corresponding to residues surrounding Ala835 of Acinus. Antibodies are purified by protein A and peptide affinity chromatography. Acinus (apoptotic chromatin condensation inducer in the nucleus) is a caspase substrate that has been implicated in nuclear changes during apoptosis (1). Chromatin condensation and DNA fragmentation are both nuclear morphological features associated with apoptosis. Acinus is expressed in different isoforms (L, S, S') most likely generated by alternative splicing (1). During apoptosis Acinus is cleaved by caspase-3 to generate a 23 kDa fragment that was reported to induce chromatin condensation (1). Acinus has been identified to be a component of the spliceosome complex, ASAP, suggesting a role in pre-mRNA processing (2-4). Down regulation of Acinus by RNA interference inhibits cell growth (5). This study also found that loss of Acinus inhibits DNA fragmentation but not chromatin condensation during apoptosis. Sahara, S. et al. (1999) Nature 401, 168-173. Schwerk, C. et al. (2003) Mol. Cell. Biol. 23, 2981-2990. Zhou, Z. et al. (2002) Nature 419, 182-185. Rappsilber, J. et al. (2002) Genome Res. 12, 1231-1245. Joselin, A.P. et al. (2006) J. Biol. Chem. 281, 12475-12484.